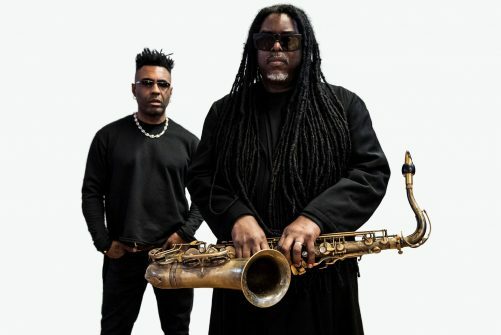 Courtney Pine and Omar have both received knighthoods for their services to music – proof were it needed that the pair have made outstanding respective contributions to music in Britain during the last thirty years. Although Pine is recognised predominantly as jazz saxophonist and Omar a soul and RnB vocalist, there are similarities to be found in the musical stories. Their respective skill was apparent from a young age, although their different paths saw Omar attend the Guildhall School of Music while Pine left his comprehensive aged sixteen, determined to pursue a career in music. 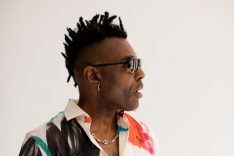 Both artists cut their first records in the ‘80s and made significant impacts with their debut full length albums: Pine defying the odds when his entered the UK top 40, signifying a renewed interest in British jazz music, while Omar’s outlined an altogether new sound in British soul and RnB. Having built upon their early successes with subsequent studio albums, tours and creative projects, their recent collaborative LP, Black Notes from the Deep, captures the maturity, warmth and soulfulness of two of Britain’s finest musical voices. Ahead of their shows at Band on the Wall in early December, which begins a regional tour, here are five tracks introducing the artists, culminating in their recent collaborative triumph. Prior to the release of his first album, Courtney Pine had played with reggae act Clint Eastwood & General Saint and possessed a love not just for jazz, but for reggae, soul music and various other styles. His meticulous approach to practise and desire to fully express himself through music inevitably led him toward being a jazz bandleader. Fortuitously, his debut album arrived at a time when interest in jazz music was on the upward curve, making his ‘the first jazz album to enter the UK top 40 pop charts,’ according to a 2000 Guardian article. Pine demonstrated his versatility as a player and writer on the influential LP, with the outstanding Children of the Ghetto speaking to the universally-moving theme of equality. Susaye Greene’s emotive vocals give this calming, soulful jazz cut a special presence. Released on Gilles Peterson and Norman Jay’s Talkin’ Loud label in 1992, this single from Omar’s sophomore album is brimming with flavours of Latin music. Omar’s unbelievable harmonies and soulful timbre give his vocal a timeless quality, while the tight rhythm brings a contemporary and groovy presence to the track. A more natural sound when compared with his debut, this track highlights the maturity of Omar’s sound early on in his career. “Jazz has always been about fusion,” Pine told The Guardian in 2000. “In housing estates you hear reggae, techno, classical; you walk through a flat and hear a random mix. But it becomes harmonious, like mixing cultures to get something different, shocking and stimulating.” By the early 2000’s and the release of his album Devotion, Pine had mastered the art of combining musical styles. He had drawn signature elements from reggae and drum ‘n’ bass, weaving them into his arrangements, but here, influenced by the sounds of Manu Dibango and Osibisa of course, he tapped into the sound of Afrobeat. Pine’s song is bursting with West African rhythm, tight harmonised horn lines and wah wah guitar. It features blazing solos from himself and trumpeter Byron Wallen, returning frequently to the infectious hook that introduces the track. Recorded predominantly at his own Backyard Studio in South London, Omar’s Love in Beats LP was a who’s who of contemporary music talent. Vicky’s Tune features the talents of Robert Glasper on keyboards and rapper Ty with the feature verse, but once again it’s Omar’s remarkable tone, vibrato and diction that give the track its drive. A constant from his early work to these production is the dry, crisp acoustic drum sound – rimshots and smooth grooves underpinning the fresh aesthetic. On Black Notes from the Deep, the finest qualities of both artists shine through. Pine returns to the tenor saxophone for the first time in a long time, his rich tone picking up where his flute lines leave off on In Another Time. Omar’s positive and encouraging lyrics, paired again with his unique tone, give this track a breeziness without compromising its purpose. The groove is deep yet its impression is light, the tone serious yet the song, sprightly.